OK with some chatting over at "What Have You Been Playing?" I have decided to set up a thread where you can review games you've played and loved, or played and hated. It can be from any gaming platform, so long as it is a video game (no board games, card games or pen'n'paper rpgs here please). Game Synopsis: Brief run down/summary of the game. 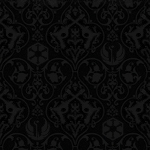 What its about, etc – you can use the official blurb from the game developers if need be. Media: Screenshots, embedded videos, etc. Gameplay Review: Pretty much as it sounds, say how the game plays and cover as much info as you feel appropriate, from storyline to controls, difficulty, length of the game, longevity etc. A good place to mention bugs or what you think they could have done better with the game. Audio/Visual Review: Say what you think of the graphics, animations, videos, sound effects, voice acting, musical score and everything in-between. This is also the place to mention the presentation of the game, even including such things as cover design / concept art, marketing events, demos and showcases. Summary: Give an overall summing-up of the game and remember to also include your personal opinion on it, as well as just a technical run-down. 10.0 (Masterful): "It doesn't get any better than this..."
9.5 to 9.9 (Incredible): "Without a doubt, these are must-own titles that stand at the top of their field." 9.0 to 9.4 (Outstanding): "...it's a worthwhile experience with just a few imperfections." 8.5 to 8.9 (Great): "An excellent gaming experience that misses the boat in just a few key areas..."
8.0 to 8.4 (Impressive): "...they're still a heck of a lot of fun and should appeal to most gaming enthusiasts." 7.5 to 7.9 (Good): "...they're still entertaining enough to provide genuine entertainment while they last." 7.0 to 7.4 (Decent): "...they still boast enough credible ingredients to make them fun in smaller doses." 6.0 to 6.9 (Passable): "Rent these games or download the demo first before spending your hard-earned money on it." 5.1 to 5.9 (Mediocre): "...only diehard fans of the particular genre will get any enjoyment out of middling games like these." 5.0 (Meh): "...the epitome of "middle of the road." 4.0 to 4.9 (Poor): "...you'll probably find yourself returning to the store for a refund." 3.0 to 3.9 (Bad): "...you know you have some major suckage going on." 2.0 to 2.9 (Terrible): "Maybe the cat could find some use for them." 1.0 to 1.9 (Abysmal): "The absolute worst of the worst." 0.1 to 0.9 (Worthless): "Okay, so we lied....We think of them as sewage in a box." 0.0 (FAIL): "Run far, far away and never look back." Info: Survival-Horror Co-Op FPS for PC+XBOX360, available from Valve. From Valve (the creators of Counter-Strike, Half-Life and more) comes Left 4 Dead, a new kind of action game for the PC and Xbox 360 that features single player, co-op and multiplayer game modes. 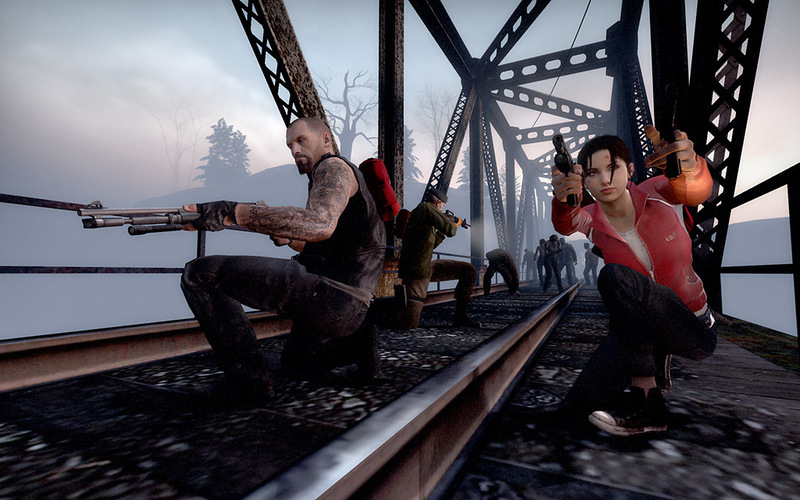 Set in the immediate aftermath of the zombie apocalypse, L4D offers four expansive "movie campaigns" that challenge you and your fellow survivors to battle thousands of swarming zombies as you travel across the rooftops of an abandoned metropolis, through rural ghost towns and pitch-black forests. Gameplay Review: The gameplay in Left4Dead (or “l4d”) is pretty flawless. Taken from the same engine, level design team and writers that brought us the scarily-good Half-Life 2, l4d is a 4-player survival horror first-person shooter which allows you and up to 3 buddies to try to survive the zombie holocaust. Its fast, frantic and more than a little bit clever with some exceptional use of physics and some nifty gameplay ideas thrown in. You play one of 4 survivors (see Concept Art, above) being Francis (an overconfident biker hard-man; my personal favourite), Louis (an office worker forced to leave his comfort zone and bash in some zombie skulls), Zoe (an 'ordinary girl' trying the make the most of being mixed up in this mess) and Bill (an 'nam veteran who sees the Horde as just another enemy to take down). Apart from “regular zombies” who come at you in hordes of 10-40, there are also “special infected” a bit like “boss zombies” who have special fun ways to make your life hell. “The Hunter” is a hoody-wearing townie who can leap huge distances and pin an opponent to the floor, ripping them to shreds. If a team-mate doesn't help them fast, their toast. The Hunter gives a distinctive scream as it leaps. “The Smoker” is a weird infected with a long tongue it uses to drag survivors away from their team-mates and strangle them. It is named after the distinctive “cough” it seems to suffer from and explodes in a green gas that causes Survivors to cough too. “The Boomer” is big, fat, slow and loud but exceptionally dangerous because, despite being fragile it can puke goo all over you that attracts a horde of zombies to come and chew on you even if they can't see you; like icky pheromones. “The Witch” is a very dangerous yet seemingly harmless infected that just sits and sobs, unless you shoot her, get too close or point your flashlight at her, at which point she runs with frightening speed and downs the survivor who upset her, tearing shreds off them doing even more damage than a hunter. Best to avoid this lass. Lastly there is “The Tank” who is pretty much what you would expect. Ignores gunfire, takes all four or you to take him down and is a relentless powerhouse of scaryness who can bap you miles away from your friends and incapacitate you while doing so, before coming to pound you into a bloody pulp. The game is mostly about ranged combat (though you can push zombies away if they surround you) and you only start the game with a single pistol and either a shotgun or uzi. Ammo is limited, and you can only carry two weapons at a time. As the game progresses you can replace your pistols with dual pistols and your shotgun/uzi with either an machine gun (wide spread, mid range, mid damage, fast reload), combat shotgun (wide spread, low range, high damage, slow reload) or sniper rifle (single target, high range, high damage, slow reload). In the way of items you get health (painkillers and medpacks) and personal explosives (Molotov cocktail or 'pipe bomb' which beeps and attracts regular zombies) as well as the occasional scattered explosives (gas cannister, fuel cannister etc). The game is interesting in that uses a system called the “A.I.Director” which 'watches' how you play and takes into account how you act, tailoring itself to make things scarier for your paticular game. If your movements are crouched and erratic in close quarters for example it might launch a horde at you the next time you are in that predicament, or if it thinks you come to expect that, it will stop doings so. This makes for a fresh but often jumpy experience playing the game. 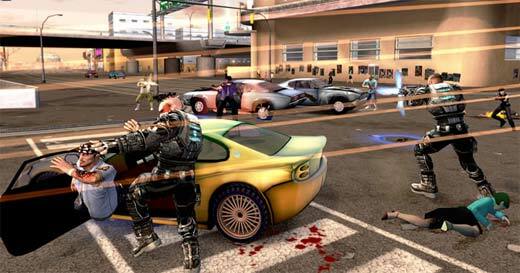 The game has 3 game-play modes, each with their own style of play. 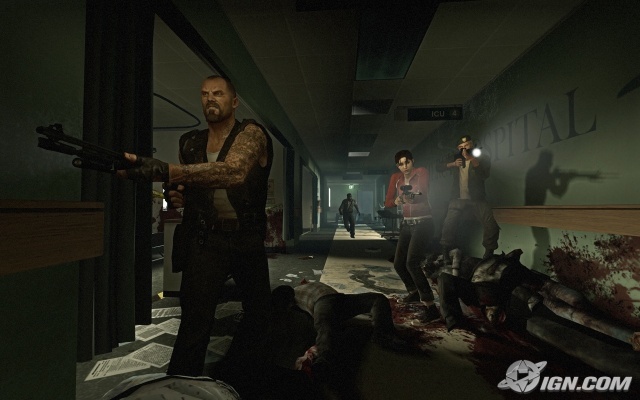 In 'Campaign Mode', the four survivors make their way from the start of the level to a safe room past hordes of hundreds of different “infected”. Upon reaching the safe room the next “level” loads and its another race for survival to the next room. There are 5 Campaigns in total, being “No Mercy” (where the survivors are trying to get to the local hospital), “Crash Course” (a shorter, two part combat-intensive 'interval' between the main campaigns), “Death Toll” (where they come across a town over-run by the Horde), “Dead Air” (where they attempt to escape via a disused airport) and “Blood Harvest” (A violent crescendo where the survivors take to the wilds to avoid the zombie infested cities). With the exception of Crash Course, each Campaign has 5 levels ranging from 10-30mins in length and ends in a finale where the horde come a'knocking in increased numbers and the survivors have to hold out until a rescue vehicle arrives (a helicopter, truck, boat, plane or apc) to take them to safety. It plays like a horror film and, like all films of that genre it doesn't bother to explain what's going on, how it started or whether it can be reversed, it just chucks you in and watches you squirm. In “Survival Mode” you get more guns, more explosives and more health, but you're trapped. This isnt one you can get out of, you and your three buddies are gonna die, period. But, its about how long you can last and how many of those soab you can take with you. A bronze medal is awarded for surviving 4mins, a silver at 7min and a gold if you live for 10mins or more. This is a great way to get an “instant action fix” if you and your friends are short on time. Lastly there is “Vs Mode” where you do one of the main 5 campaigns with 8 players, 4 per team. Four play the Survivors and four play the “special infected” (though you only get to play the Tank at certain parts and never get to control the witch ). Its the survivors job to reach the safe room and the infected's job to stop them. When all the survivors die or all reach the safe room, you swap sides. The game comes with 4 levels of difficulty: Easy, Normal, Advanced and Expert. These can be changed while in-game via a vote system. Voice chat it available and easy to use and requires no extra software such as Ventrillo or Xfire as it is built into the game. A few months back Valve released the SDK Source Tools for L4D and there have since been an influx of user-made campaigns and maps for PC users. Though some of these aren't great, the vast amount have been made to a much higher level of skill than most people would have expected and have significantly increased the longevity of the game even further. There are also over 60 achievements that can be claimed for doing exceptionally well in the game and both PC users and XBOX360 games can join in the same internet games, cross-platform. Audio/Visual Review: I've been trying to wrack my brain to come up with something bad to say about the graphics but I simply cant. Not only are they technically exceptional, but the animations are solid and smooth, the characters have a great level of detail on them (even the infected, some wearing cool tshirts and the like). Even with the massive amount going on at one time, with hordes of zombies, explosions, gas-clouds etc part of what makes this game so impressive is that it plays beautifully even on lower-spec machines and is not very demanding on your processor. That means everyone gets a fast and mental ride on lan and single-player and is only limited by ping across the intenet. The sounds are equally very good with eerie music throughout which goes from creepy and oppressive to loud and urgent when a horde approaches or a tank is sighted and also gets very fast during the finale, all adding to an already accelerated heartbeat of the players. Similarly the sound effects are neigh-on perfect, with explosions, doors clanging, machinery sparking and whistling wind all sounding very believable. The Infected all have their specific sound sets which allow the savvy player to recognise them long before they see them, but the first time you hear a horde running your way, let me tell you – its an experience. Summary: Overall, this is one of my favourite games of all time. It's easily the game I play the most, even now a year on, and I play it almost every day (I'd say 5 in every 7) even if its only for 30mins at a time. A gorgeous, scary, funny game that keeps me coming back for more, I think the only way I am putting this puppy down is when Valve release Left4Dead2 next month. I heartily recommend this game to anyone who is a fan of the Horror Genre. In all honestly the only thing that keeps it from getting a perfect 10 is that I found the Campaign mode a little short. Other than that, gaming perfection – for me at least. Well its been 3 weeks since I did this review. No comments? good or bad? More importantly, no other reviews from people? Nah, the thread's good, the system of reviewing is actually really well done and the first reveiw is stunning, magazine quality. However, it is simply too much effort for us (though I may just be talking about myself here) to make up a review spur of the moment with having to get videos, pictures and two different reviews. It is actually the supreme quality of your of LfD review that puts me off making my own because I know that it would take far too long to make a review as good as yours. To be honest, I'd just do one 300 word review with a brief summary, rating and a single picture characterising the game, but I know that if I did this then it would look terrible compared to what you've already got on the table and I'd look lazy and inefficient. I was starting to think the thread had an evil virus or something :S cheers for replying Harl! tbh its not the length of the review that should be in question, or really even the quality - I (and I hope many other people here) trust people's opinions on this site and like to hear what people think. A 300-word short review that says your honest opinion on stuff will always be more engaging than a "War & Peace" sized novel if its an interesting, provocative review. If you wanna right a shorter one (or anyone else for that matter) please, feel free! I'm a gaming nut but don't have the time to try even 1/100th of the games I would like, so if someone here can tell me what those are like, I'd be well-chuffed! When you first enter upon Pacific City, you are speeding over the heads of policemen and gang members alike having emerged from a tunnel in a supercar leading to your base. You are an agent, but had the game put you in multi-coloured tights, you'd have easily been labelled as a next gen superhero. It becomes clear that you are far superior than any 'normal' human, able to pistol whip, roundhouse kick and then headshot without a seconds notice. The game is extremely well detailed though, as you explore, you come across various sights and you soon find that Pacific City is like a mix of Las Vegas, Mexico and Hong Kong, but the graphics to die for, with clean and crisp cell-shaded models looking like they stepped out of a Marvel Comic. This is indeed a game that looks awesome, but does it feel awesome? In typical roleplaying style, your character evolves with you. Depending on what you do, one of five different attributes increases, shaping the way your character plays and looks. However, unlike a normal roleplay, there is hardly a scrap of a storyline, at least not an in depth one. The basic mission is for you to take out 21 gang bosses using the guns and cars you can find, good luck. After little time, the lack of a decent story becomes a noticable drain on the game experience, but the different gang bosses and open ended ways you can take them out certainly do a good job of covering up the lack of a tale. Then comes the AI. Your enemies are basically hoodlums which ignore you, driving peacefully in cars or bystanding with their friends unless you shoot a weapon. They don't actually do anything interesting and even though it's without doubt that they can give you a run for your money, it feels bland and there are only three different flavours of these men which eventually decreases with each major gang taken out. The sounds the enemies make are equally terrible, a mix of vile screaming, swearing and shouting. Even when supposedly non-hostile in a public relations department, they still make the same terrible screams though not attacking you. Things really go up a notch though when you upgrade. The explosions you make get bigger, the cars the agency offers you get cooler and your jumping becomes akin to a Spiderman on steroids. This jumping is were the game really comes into it's own. With such a big sandbox world, though cars are faster, it's hard to get the onto the roof, but jumping allows you to cross buildings with a single leap. However, in typical Sandbox style, you are unleashed onto the world. You can go rogue and kill civilians, angering policemen and making them send out specialist squads. You can fashion your own fireworks show complete with cars, gas tanks and armoured vehicles, and although you can't level buildings, you can certainly jump over them - and preferably land on a poor bystander's face. Summary: A game with an awesome world and graphics to make it look stunning, with a variety of choice and secrets awaiting you. It's just a terrible shame that the lack of decent AI, story and mission variety makes it more mediocre than it should be. Still a game worth picking up for only a tenner to fifteen pounds for it's beautiful environment. I got a chance to play Crackdown when it was first released, although only very briefly (it was a mate's console and I only got about 10mins worth!) - It struck me, as you said H2, as being very graphically impressive; I have to admit that I got very little chance to actually interact with AI as I only had a short time to play it. For my short time I chose to go freeform (as in, when you cant be bothered doing the missions in GTA and decided to crash/shoot/jump everything in sight for a laugh), which I have to say I enjoyed immensely. In fact, looking back on it I think playing Crackdown for that small amount of time may have subconsciously implanted the seed in my brain that made me purchase Prototype which is quite similar in its freedom. With graphics similar to Quake 3 and proper online shooter capabilites, it's hard not to love Eliminate Pro on first sight. The game works with you defeating enemy players for credits which can buy tonnes of options to customise your own soldier, including armour, weapons, stats and colours, you really do have a purpose to play on. You must play to a guideline though, you're given a power bar which dictates how many matches you can play for, and with each full bar, you can play roughly 2-3 matches. Once you run out though, you'll have to wait 1-2 hours for it to refill, which can get extremely tedious for only one style of play, and though it is free, if you want that armour, you'll have to buy power packs with real money which will get you another 5 matches per 60p, otherwise, you'll have to wait a long time. Matches also last a very short time, around 5 minutes, with only 4 players maximum. It also doesn't help that it has no story, with the only thing resembling one being a woman talking about you as an employee with experimental armour. Controls are difficult too, it's hard to aim and turn around. The lag may also get to you, which can hinder your gameplay, but luckily not steal away your power. Luckily though, it seems relatively bug free and even goes so far as featuring water and swimming, along with a very Halo/Crackdown platform jumping at times. It's certainly not as good as a console game (or at least most), but for the iPod, it's excellent. Summary: A game that, though only offers one (albeit fun) style of play, features tonnes of customisability that may be updated over the future to include more options and it's free. However, it's lack of map variety and tricky controls makes it difficult to get around, but it's worth picking up just to try out. Aye I'll do a Dragon Age one, but not till I've completed it - which I'm putting off at the mo. Fancy doing a l4d2 one, PJK? It worries me sometimes that I've clocked over 200 hours on this game and I still find it highly replayable - I only hope that there is as much user-created content released for l4d2. LOL! You leave my Bill alone! Oh and "the real" Zoe is lush Mr. Dubz. Game Synopsis: "We're not in Azeroth anymore.."
Set on the world of Telara, cracks in the fabric of reality known as 'Rifts' are allowing denizens from the elemental planes of Earth, Air, Fire, Water, Life and Death to enter the world and two idiologically-opposed groups - The Magic-based Guardians and the Technology-based Defiant - stand to hold them back. Where to begin? Well, Rift is - in the beta at least - very, very promising. 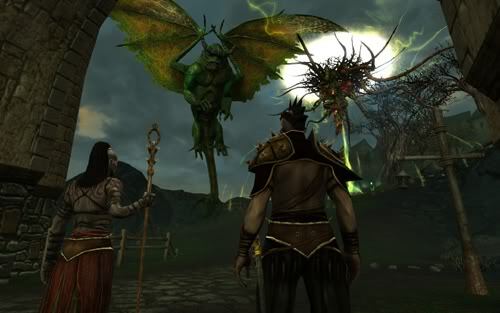 Gettng the comparisons out of the way yes it DOES share a lot of elements with the mmos that came before it, taking many of the most successful aspects from the Everquest, Guild Wars, Lord of the Rings Online and WAR series of games. There are also a lot of direct comparisons with World of Warcraft. All of these comparisons are fair to some degree because Rift does not try to break the mmorpg mould....on the surface. The vast majority of changes are more hidden, but become apparent as you play. More on that later. For the most part, Rift will feel familiar to anyone who has ever played an mmo. There are action bars (the main one corresponding with the numbers 1 through to 0) and its the same WSAD movemt with TAB hot-switching between opponents. All the elements of PvE questing, PVP battlegrounds and instances/dungeons are there, along with player hubs (Capital Cities in this case), mounts, crafting etc. While each of these have additions to the usual rules, none are paticularly new - they feel familiar. 224 'classes' in the game. * PVP with PVE content: Now I've not actually done PVP so I'm only going by whats been plastered on the internet here, but PVP in Rift is meant to be quite a major affair. 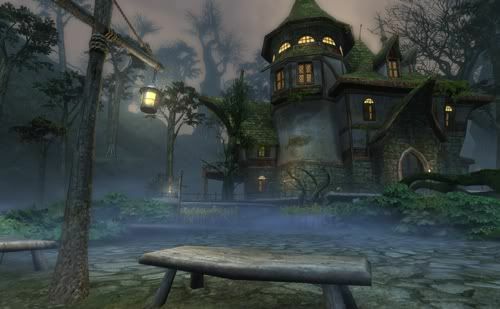 Apart from getting specific pvp equipment (like in most games nowadays) and unlocking PVP-Specific Souls (which cannot be unlocked through PVE content), it seems that the Warfronts (Rift's versions of Battlegrounds) also have plenty of PvE content built into them so players can annoy and upset the opposing faction and keep them from their goals. There is said to be open-world pvp areas as well but I've not looked into these. * Rifts, Invasions, Footholds: Rifts are - somewhat obviously - a big part of the game. They happen anywhere, anywhen and don't give a flying ewok whether you were talking to your quest giver or doing a bit of RP at the time. Truly dynamic, players need to band together and take down rifts as soon as they appear, otherwise there are actual consequences. Should a Rift stabalize (basically not be closed by players) then an Invasion happens - meaning more powerful creatures come through the Rift...and keep coming. Should enough of said creatures come through it becomes a Foothold and the creatures become more powerful (the equivilent of becoming Elites) and the enviroment begins to change. If the players STILL don't sort it out a major boss comes through (quite often huge) and starts treading on all the wee players and npcs alike. These are the equivilent of World Bosses in other games. Interestingly enough the beings that come through don't often get along, its not unusual to ride past and see Death Rift creatures and Earth Rifts creatures beating one another to a pulp! The Crafting System seems pretty robust and isnt that different to the likes of WoW or LOTRO. Crafting is very easy at first but becomes more difficult later on with harder materials to collect in bigger quantities - the fashioned goods are pretty good though, and it rewards the crafter who puts the time in. You can have 3 'professions' per character, and you choose between at total of 9: 3 Foraging ones (Butchery, Foraging, Mining) and 6 Crafting ones (Apothecary, Armorsmithing, Artificing, Outfitting, Runecrafting and Weaponsmithing ) and most hubs have the crafting areas for you to continue your work. Its not all roses and happy times though. I'm often a little over-critical of games in my head and tend to not write the bad parts in reviews because I feel bad about doing so. I feel that Rift is a 'full grown mmo' though, so am going to do so here. I do have some issues with the game. Firstly, with the huge customisation in character class builds, the designers seemed to have really not gone as far as they could with the rest of character creation. There are only a total of 6 races in total and two of those (the High Elves and Kelari) are almost identical physcially. Though you can chose loads of hairstyles, tattoos/makeup, height and the shape of your face all the body models are set in stone. There is nothing to alter the size of any body parts (like chest or arm / leg length) which means at the beginning of the game where everyone is wearing starting equipment, unless you get really close everyone looks like carbon copies. Luckily this sorts itself out by about level 10 with all the new equipment and clothes dyes, but it feels like the developers were going "ah, nobody cares what they look like under their armour - why bother?" and that annoys the heck out of me. Also, there is no "style" tab, so you can't keep a look you like, you have to go with the item sets or suffer the shame of wearing that lvl 5 hat you liked at lvl 40. A lot of the major npc placement seems a bit....crap. In the major cities you just have bosses sortof 'hanging around'. usually in the corner of some (admittedly wonderfully modelled) grand hall - they don't even get their own room. Lastly there are way too many 'box-buildings', by which I mean buildings you can't get into - they have closed doors and are just there for decoration. I love rooting around inside different areas in mmos, its the explorer in me. But in Rift you often can't do that. There is the occassional building you can go in, and its great when you can but they're so far and few between that it really lets the side down. Oh, and there is no player housing. Perhaps after Launch something like this might come about, but I doubt it. Visually Rift is pretty impressive, but nothing ground-breaking - a lot like many other mmos. It shares a lot of its design with WAR (not surprising considering it uses the same game engine), but does a good job of mixing the fantastical with the mundane to give an interesting visual experience. Each of the areas I went too looked quite different and had their own 'feel', something which becomes even more apparent when a Foothold takes over and even the sky changes to match the elemental plane that is in control. Overall the graphics are good as are many of the weather and particle effects, especially some of the spells and other abilities available to players. It runs at a good FPS rate on all but the oldest of machines and most people will be able to play it on high settings. The colours are more varied that its predecessor WAR, and more subtle than the those used in games such as World of Warcraft or DCU:Online. I would say it sits somewhere between Vanguard and Age of Conan. The Audio is again, good but not ground-breaking. The music is atmospheric but is fantasy-based so will not be to eveyone's taste. As it seems with most mmo's the voice-acting is 'OK' though there are some paticularly good bits - and bad (the opening credits guardian voice springs to mind). Summary: I'm personally a really big fan of Rift. It came out of nowhere and took me by surprise and it was a pleasant surpise at that. 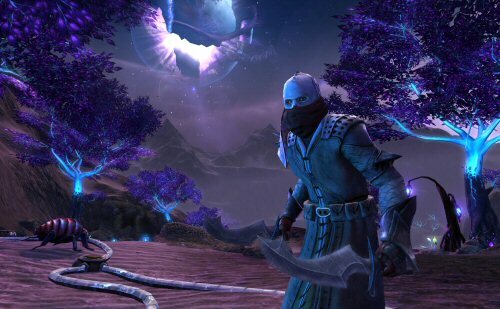 Rift did exactly what I wanted in a mmo: It was familiar but with enough new content to make me sit up and take notice. It addressed a lot of the niggling issues I have with mmos. It felt and looked like WAR but gave actual PvE gameplay rather than pushing you toward PvP, and rather than trying out hundreds of new gimmicks to try and sell it (which usually ends badly) they instead just got what people have done before them, improved it and put their own spin on it. It felt incredbily polished at Beta, more so than many premium games I've bought, and the class customization is just incredible. I love the randomness of the Rifts as well, it really keeps you on your toes and insures you always have something to do. 2 Factions; Guardian and Defiant. Crafting: Full crafting system with 3x Foraging and x6 Crafting professions. You can have a total of 3 professions per character. "...it's a worthwhile experience with just a few imperfections."